(Video) Game on? Yes and No. Leslie Rule is studying at the Harvard Graduate School of Education in the Technology, Innovation, and Education (TIE) program. She specializes in hands-on, in-depth, project-based workshops using geo-apps, mobile devices, and storytelling techniques to explore place and community. I am not a gamer. Never liked board games. Pre-date the video game revolution. I have played many games of tennis, have on occasion gamed the system, even been bested by the game of life...but video games, not so much. But one part of the video game I love: the world created, otherwise known by the rather antiseptic term “virtual environment.” My son will often call me over to watch the opening “cinematic” of a video game, where the virtual environment (the amazing fantasy world) is introduced. Think Oz or Dune, Narnia, Middle-Earth, or Rivendell...or my son's favorite, Spira of FFX. What affordances (roughly defined “action possibilities” or learning tools) does a virtual world offer that the real world doesn't? For the concerned environmentalist in all of us, researchers at the Harvard Graduate School of Education are investigating just that question. Chris Dede, Tina Grotzer and team have built a virtual ecosystem/world of EcoMUVE: Advancing Ecosystems Science Education via Situated Collaborative Learning in a Multi-User Virtual Environments. Naturally, collaboration among multi-users is assumed. 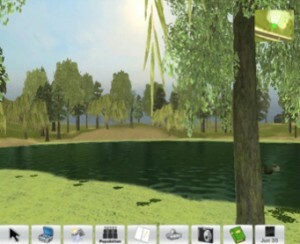 The study of ecosystems in a learning context (e.g., a virtual world) where passage of time, size and scale, space and orientation can be controlled encourages deeper engagement with the material; it not only immerses the learner, but natively accomodates differing learning styles allowing a individualized mixing and matching. In education, the deeper the immersion, the deeper the learning. But virtual worlds are virtual. In some learning contexts they excel, but in others they can't compare. Eventually, learning happens best in the real world. Unfortunately the debate over gaming and virtual worlds in teaching and learning has taken an all-or-nothing approach instead of the more sensible hybrid approach, incorporating both real and virtual. Virtual worlds offer the unique affornances mentioned above, but to know an ecosystem only virtually (whether through a MUVE, a book, or a terrarium) is to know it almost not at all. Ecosystems must also be studied in their milieu: the real world. The influencial Brazilian educator Paulo Freire's distinction between “community-as-text” or “text-book-as-text” is fitting (community here refers to people or a place or to both). In education, we don't use the community as our resource, and that is a sorely missed opportunity. In this case, an available ecosystem (we all have one) and the people who make it their job to take care for it are the perfect educational resource. The real world, full of real places and real people, and the virtual world where imagination and experimentation is unbounded is the stuff of interesting, compelling and engaging learning...the components most missing in traditional educational settings.